Join ILACSD and the County of San Diego for a litter cleanup in San Luis Rey on August 18 from 8:00 AM to 10:00 AM! Volunteers will meet at the corner of Old River Road and Little Gopher Canyon Road, Bonsall, CA 92084. 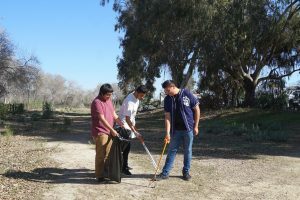 We will collect trash along the San Luis Rey Riverbed to divert waste from the watershed and beautify the community for summer hikers! This is a great opportunity for students and families to learn ways to protect our local environment! We will have cleanup supplies, snacks, and water. We also provide community service hours and Letters of Appreciation for volunteers. We encourage volunteers to bring their own reusable items such as water bottles, work gloves, and buckets to promote zero waste practices and help us in our mission to have a zero waste, litter-free and environmentally engaged San Diego region!